This is the bizarre moment a TV weatherman appeared to be caught faking his battle against gale-force winds during Storm Florence. 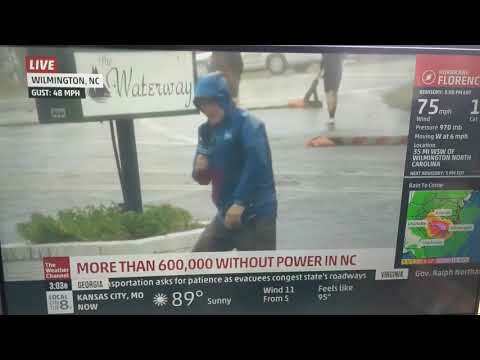 The Weather Channel’s Mike Seidel was seemingly battling to stay upright as he filmed a piece in North Carolina — only for two pedestrians to calmly stroll past in the background. Typical fake news tv low level actor. THE WIND IS BLOWING IN THE OTHER DIRECTION!!!! Mainstream Media Fake News Enemy of the People can’t even report the weather without faking it. Mainstream Media Fake News Enemies of the People cannot even report about the weather without faking it.